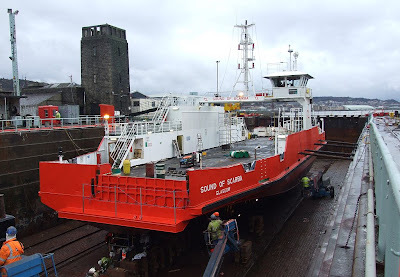 Since Tuesday 22 January, the Garvel Drydock in Greenock has been occupied by three vessels, the first time that this number have been docked together for quite some time. At the west end of the dock, nearest the gate, is Western Ferries' SOUND OF SCARBA, undergoing her annual survey. Sitting ahead of her is SD-TORNADO, one of the two remaining torpedo recovery vessels in the RMAS/Serco Denholm fleet based in the neighbouring Great Harbour. Carrying pennant number A140, SD-TORNADO was built at Aberdeen by Hall Russell in 1979. 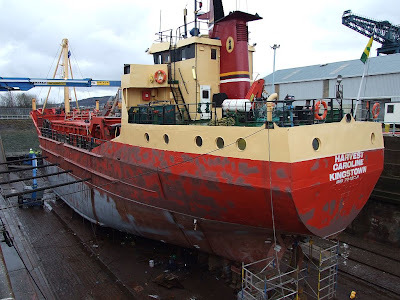 At the top of the drydock is Ferguson Transport's HARVEST CAROLINE, a small coaster used to transport feed to the numerous fishfarms around the west coast of Scotland, with occasional cargoes of aggregates also carried from Glensanda. She is normally based at Kishorn, and dates from 1971, when she was built as BRILAND by the German shipyard Elbewerften at Rosslau. 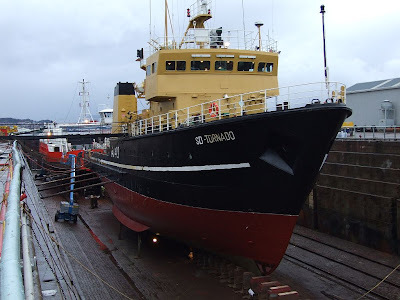 She has borne numerous names since, most recently being FJORDBULK, which she carried from 1984 until 2006 when she was acquired by her present owner. HARVEST CAROLINE is 54.2 metres in length, and has a gross tonnage of 712.